There’s nothing more irritating, when you’ve struggled unsuccessfully to grow a plant in your garden, to find it growing happily in the most unwelcoming places. Check out the beach, where howling gales, salty winds and the poorest of soils are home to some gorgeous plants. Of course, they are specially adapted to these conditions so enjoy them where they are, and bear these conditions in mind when you adapt their habitat to your own garden. From the Lizard to the Shetland Isles, our coast is peppered with treasure troves of seaside flowers (see http://www.plantlife.org.uk for a list of the best) and here on the south coast, beaches like Dungeness are home to a world of wild plants including rare spider and lizard orchids; Shoreham-by- Sea’s vegetated shingle is packed with over 90 different wild flowers; and a visit Sandwich Bay will offer dunes scattered with pretty blue sea holly and mauve sea asters. These beaches may not be miles of gleaming golden sands, but they’re much loved by locals, visitors and the wildlife that teems along these shores. As I cross the groins to reach Seasalter beach, a sea of pink and white valerian (cent ranthus ruber) proliferates in the well-drained soil, sometimes growing in the cracks of walls or in among the decking of the gardens that line the beach. These plots have been mulched with pebbles, seashells and seaside ephemera and edged with driftwood, rope and tidal flotsam and jetsam to stop the wind blowing away the soil, because it’s the winter’s gales, salt laden mists and tidal surges will decide ultimately whether these drought resistant plants are long term successes or just temporary glories. In windy areas, plant a shelterbelt of tough salt tolerant shrubs and trees, including alder, hawthorn and holm oak. Grow suitable plants for sandy soils, for a full list visit www.rhs.org.uk. Incorporate organic matter, loam and fertilizers like blood, fish and bone in spring to improve soil and increase nutrients. Mulch, then top with pebbles and shells in spring to improve water retention and stop soil from being blown away. Collect rainwater from your roof to water plants in summer. The brighter light is more forgiving of bold colour combinations, so experiment. The photos in this blog are by Vic Spofforth from my book Flying the Coop, charting my move to Whitstable. Available here for the knockdown price of just £5.00. Walking from Whitstable to Seasalter, I’ve spotted cerise mallow plants (malva neglecta) growing happily in the beach huts’ rubble foundations. Driftwood artist and beachcomber Martin Pamment (http://www.kentbeachart.com) builds these cabins on the shoreline and says when he digs down through the foot or so of shingle, there’s a layer of sandy loam that beds on local clay. Further towards the high waterline, there are mounds of grey-green sea-kale (crambe maritime) that burst into clouds of tiny white flowers in June and July. The young leaves are edible steamed with butter, and popular with foragers. Seeds are available from www.suttons.co.uk. 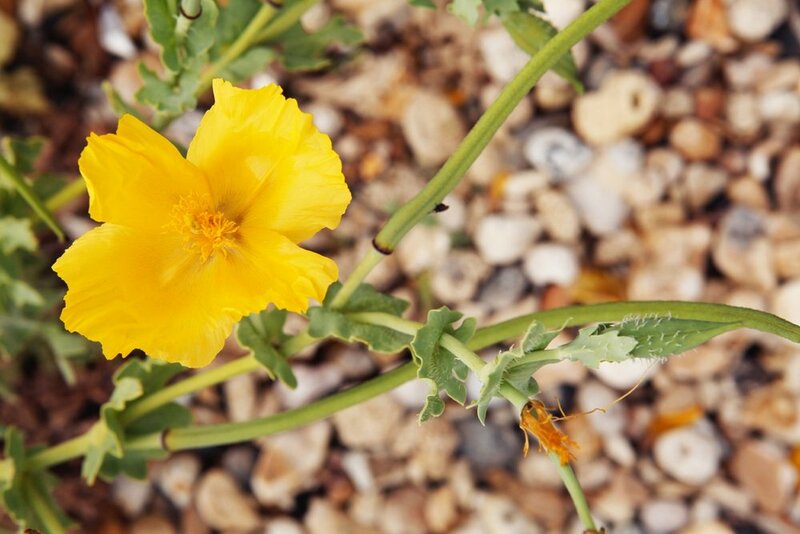 Next to them grow exotic-looking yellow horned poppies (Glaucium flavum) with silvery-grey crinkled leaves, bright yellow flowers and sickle-shaped seedpods, some 30cm long. A protected species that must not be picked from the wild, you can buy seeds from http://www.plant-world-seeds.com, scatter them on top of compost after a month in the fridge, (but you’ll have to be patient, it can take them up to a year to germinate). They look spectacular next to the pale blue sea hollies and royal blue flowers of Viper’s-bugloss (echium vulgare) that are covered in bees and insects – not so good for humans though, their leaves can irritate skin. Each year brings different plants: the blue grasses are new and the tidal surges this spring eradicated the horned poppies in front of my beach hut and exposed a meadow of sea-pea seedlings.